No fun projects to report here. I watered my “seven new perennials” today. Does that count? Ok. I guess I was fishing for some ‘cred. I also stomped all over the fluffy areas of the weed mat where the weeds are growing underneath. Hopefully they’ll get the hint, but I’m not holding my breath. This weekend will be relatively uneventful. I’m looking forward to it. At the very minimum, I need to make sure I get some more mulch spread in the front yard and get that finished up. Or else I’ll dwell on it alllllll next week. Getting the rest of the baseboards back on will also be a priority. I’d like the new floor project to be done with. Missing baseboards just look so glaringly unfinished. It’s rainy and windy here tonight, and it’s supposed to be cool/windy/rainy (maybe even nighttime snow) the rest of the week. I want it to warm up! WARM UP, I SAY! We recently signed up for milk delivery. Foo foo, yes. More expensive than Safeway…yes. Surprisingly amazing tasting? Like I-didn’t-know-milk-was-so-awesome amazing? YES! It’s yummy, and it supports our local economy too, so I feel pretty good about it. PLUS….I bet I could go visit the cows if I really wanted to. Which I might. (want to). My husband thinks I should open a petting zoo. The cows might suffice. Did I mention I had to wait for an elk to cross the road yesterday morning on my way to work? And that the group of horses grazing across the way were playing tag on my way home from work? Cute buggers, frolicking around. Are you thinking I’m a loon? Me too. Time for bed. There is still some put-away/put-back to do. And we’re dishwasher-less until tonight when the new one is delivered and installed (and the old one taken away!). And we still need to put the dining room and living room baseboards back on. I can’t wait to have a quiet dishwasher!! But despite those little things, the big stuff is done! My cute little spring hearth....next to some ugly carpet! Various shots of the pretty new peninsula...but I promise it's prettier with the new floor...! And now for the AFTER pictures! YAY! The orange cabinets look particularly garish against the floor color now. We’re planning to buy a sander this weekend! You know what that means…… :-) PAINTING CABINETS! We love it! It’s so nice and clean feeling, compared to that nasty carpet that had who-knows-how-many peoples’ and animals’ dirt in it. The cat doesn’t like the hard floor quite as much as the carpet. Even though her toys fly across the floor and are much more fun to chase, her “flying squirrel” act off the stairs results in her sliding into the far wall. Hopefully that stops, but we’ll see. I would think it hurts to land on a hard floor from six feet up from a full sprint? Thanks for stopping by! Sorry no little projects to show you lately! Once we get this big one put to bed, I’ll have time to get back to the smaller projects on my list. 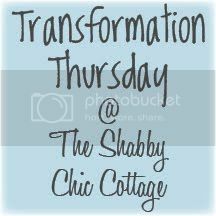 so be sure to pop on over there and check out all the cool transformations!